The ancient art of fuming, said to have been discovered by observation of chemical reactions in equine stables, creates the warm, tawny beauty of gentle flames. Single fuming suggests pale, tender warmth with hues of tobacco, while double fuming, which takes many months, achieves a richness that recalls the resonant sound of the cello. The application of modern firing techniques transforms the colour of prime grade, knot-free oaks into deep brown tones that penetrate the depths of the wood, opening the grain to burnish the hues into fiery intensity. Once again, all the usual finishes can be applied to the wood after the fuming process. Thermo treatment brings out and accentuates the best characteristics of the wood – the colour is a very deep chocolate brown which exists throughout the wood – unlike a stain which simply covers the top of the board. The boards are heated to a high temperature which causes the colour to darken, there are no chemicals used during this process – simply heat and steam. 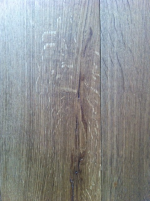 The density of thermo oak is lower than untreated flooring. The strength of the timber is also relative to the density meaning that the thermo timber has lower strength values to standard oak. As the density is lower, a solid thermo floor is not recommended for structural use.